Here's a list of the 1001 classic movies you should see for 2017. Go here for the movies reviewed in 2016. The films made in Hollywood's studio system between 1930-1970 were an unparalleled outpouring of artistic achievement. Never, except perhaps in the Italian Renaissance, have so many great artists been gathered together in one place and one time. The Hollywood studios nurtured (and, admittedly, in some cases discarded) great talents like the visionary director John Ford, the anarchic comedy of the Marx Brothers, and the soaring voice of Judy Garland. The studios were also a safe haven for talent from around the world, especially before and during World War II, when artists like composer Max Steiner, writer and director Billy Wilder, and actress Ingrid Bergman flourished. Estimates vary, but the Hollywood studios pumped out about 400 films per year during the 1930's-1950's, which gives classic movie fans a dizzying array of options. This list isn't designed to be a best of list (I realize that virtually no one has the time to watch all 1001 selections), but more of a guide for classic movie newbies and those dedicated fans who want to learn more about their favorite stars and films. This list will only contain American films made between 1930-1970. It will exclude all foreign language films, and English films not made by the Hollywood studios (for example, I'm not going to consider Alfred Hitchcock's work before he came to America to make Rebecca in 1940). Each month will cover a specific topic related to an actor, director or theme. So, without further ado, here's a list of what's been written and what's coming up. World War I centennial: World War I was a rich subject for old Hollywood filmmakers. To commemorate the 100th anniversary of the United States' entry into the conflict, I'll look at four diverse films set during "the war to end all wars." 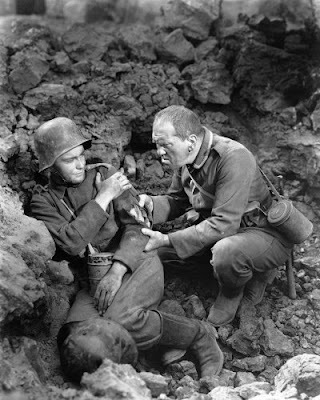 All Quiet on the Western Front (1930): This powerful drama about the lives of ordinary German soldiers is still old Hollywood's greatest anti-war film. The Fighting 69th (1940): This Warner Bros. film rallied support for World War II by telling the story of a cocky private (James Cagney) who saves his regiment. The African Queen (1951): Old Hollywood churned out quite a few romances involving the Great War, like this all-time favorite starring Humphrey Bogart and Katharine Hepburn. Lawrence of Arabia (1962): This biopic of an eccentric Englishman who became an unlikely champion of Arab independence remains a landmark of world cinema. Hollywood on Hollywood: I'll start off the new year by looking at four very different films about Tinseltown. FYI: I already wrote about Esther Williams' performance as silent star Annette Kellerman in Million Dollar Mermaid (1952). 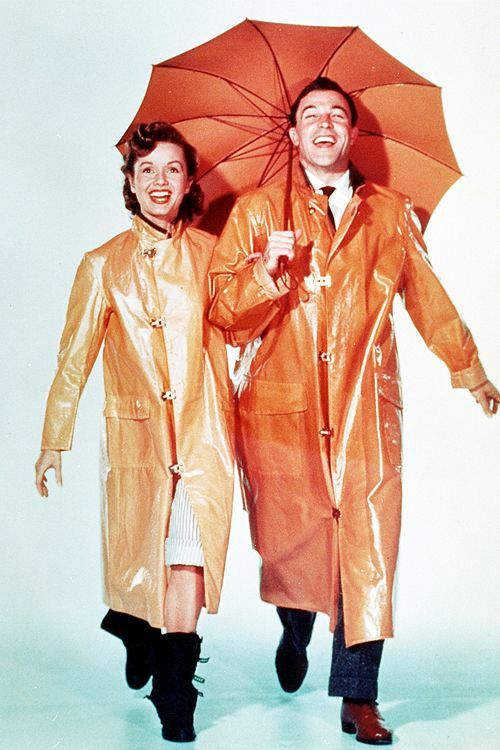 Singin' in the Rain (1952): This all-time favorite chronicles the sometimes rocky transition from silent to sound films for a star (Gene Kelly), an accompanist (Donald O'Connor), and a young actress (Debbie Reynolds). Sunset Boulevard (1950): Writer and director Billy Wilder's caustic satire about the delusions of faded silent star Norma Desmond (Gloria Swanson) is among the best noirs ever made. Sullivan's Travels (1941): Preston Sturges' timely comedy is about an ambitious director (Joel McCrea) who goes from Hollywood hotshot to chain gang member. A Star Is Born (1937): Janet Gaynor was the original Esther Blodgett/Vicki Lester/Mrs. Norman Maine in this soaper about the triumphs and travails of life in Hollywood. 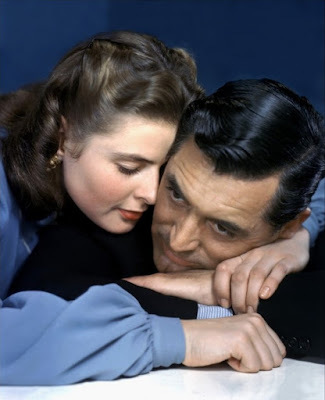 Leading Ladies of Cary Grant: Old Hollywood's all-time great leading man worked with several great actresses throughout the decades. In February, I'm choosing one great movie from each decade of Grant's career that features a memorable leading lady. FYI: Grant's leading ladies who have already been covered in this series are Joan Fontaine; Ann Sheridan; Rosalind Russell; Katharine Hepburn; Grace Kelly, and Eva Marie Saint. The Awful Truth (1937): This screwball comedy about a bickering couple who are on the verge of divorce co-stars Irene Dunne, who was one of Grant's best leading ladies of the 1930s. Notorious (1946): Grant and Ingrid Bergman set off sparks in director Alfred Hitchcock's World War II espionage thriller. An Affair to Remember (1957): This all-time great romance about two lonely people who find love on a transatlantic cruise co-stars the always lovely Deborah Kerr. Charade (1963): This Hitchcock-esque thriller from director Stanley Donen features Grant as a mystery man who is trying to protect a young widow played by Audrey Hepburn. Going Ape in Old Hollywood: The March 10 release of Kong: Skull Island (2017) is the latest in a long line of Hollywood monkey movies. In March, I'll write about three action-adventure movies and one comedy that feature apes in one form or another. 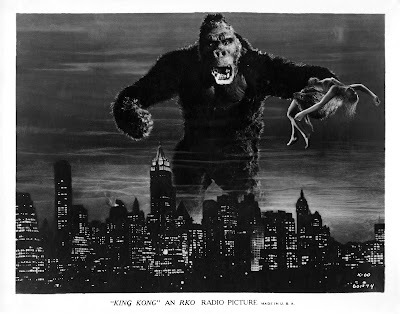 King Kong (1933): Despite countless remakes, sequels, and spoofs, this granddaddy of the creature feature is still one of the most thrilling films ever made. At the Circus (1939): A gorilla on the loose is a major plot point in this zany Marx Brothers comedy about a traveling circus troupe. Tarzan the Ape Man (1932): The demure Jane Parker (Maureen O'Sullivan) is kidnapped by Tarzan (Johnny Weissmuller) and his ape allies in the first movie in this long-running series. Planet of the Apes (1968): Charlton Heston gets pawed up by "damn, dirty apes" in this science-fiction classic from the mind of The Twilight Zone creator Rod Serling. Happy Easter! : I'll celebrate spring with three films that deal with Easter in one form or another. 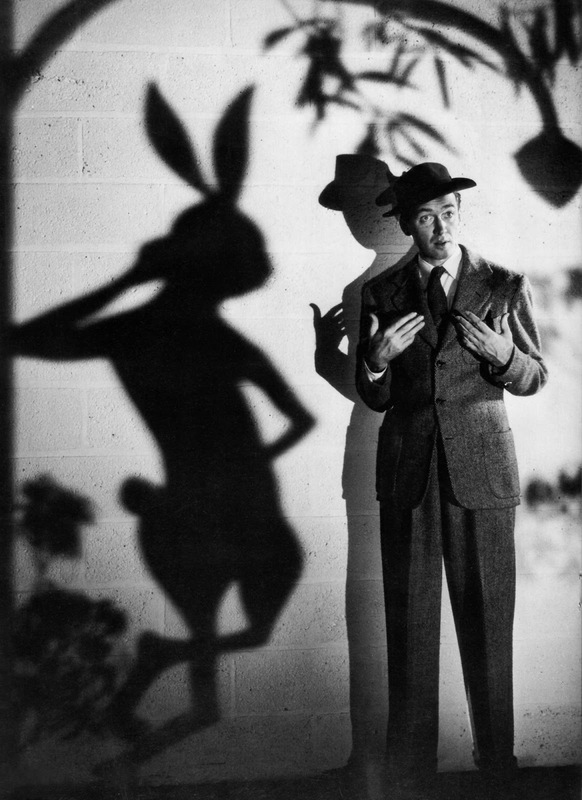 Harvey (1950): James Stewart's six-foot-tall invisible friend isn't exactly the Easter Bunny, but he is one of old Hollywood's most memorable rabbit characters. Easter Parade (1948): Judy Garland, Fred Astaire, Ann Miller, and Peter Lawford take part in the annual New York tradition in this beloved MGM musical. Rebel Without a Cause (1956): Director Nicholas Ray's tale of teenage angst begins on Easter Sunday. The Leading Ladies of 1942: I'm celebrating the 75th anniversary of this banner year for Old Hollywood with four movies featuring outstanding female performances. 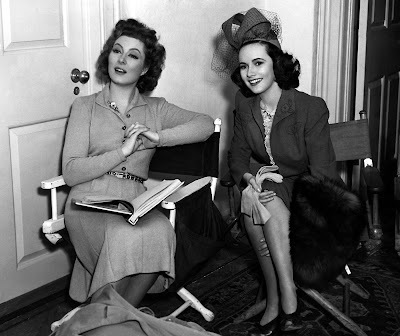 Mrs. Miniver: Both Greer Garson and Teresa Wright (pictured above) won Academy Awards for their performances in this homefront classic. Now, Voyager: Bette Davis gives one of her greatest performances as a New England singleton who finds love after shaking off the influence of her domineering mother (Gladys Cooper). Woman of the Year: The great Katharine Hepburn appears for the first time with Spencer Tracy in this battle-of-the-sexes comedy. The Magnificent Ambersons: Character actor Agnes Moorehead demonstrates her serious acting chops in director Orson Welles tale of a turn-of-the-century Indiana family.